For other uses, see BB8. BB-8 (or Beebee-Ate) is a droid character in the Star Wars franchise, appearing in the 2015 Star Wars: The Force Awakens, 2017 Star Wars: The Last Jedi and 2019 Star Wars: The Rise of Skywalker films. Spherical with a free-moving domed head, BB-8 is portrayed by both a rod puppet and a remote-controlled robotic unit. BB-8's design was based on a sketch by The Force Awakens director J. J. Abrams. According to special effects artist Neal Scanlan, "It was a very simple sketch, beautiful in its simplicity of a ball with this little dome on top." His design included asymmetrical panels to make it easier for the viewer to track motion, because, Scanlan says, "If you had parallel patterns that ran around the circumference, they would be less informative as to the direction BB-8 was traveling". Abrams also named the character, saying, "I named him BB-8 because it was almost onomatopoeia. It was sort of how he looked to me, with the 8, obviously, and then the two B's." The name was conceived early on in the film's production and was one of the few to remain unchanged. Before receiving his final name, the droid was nicknamed "Surly" by the pre-production team. In August 2013, The Force Awakens cinematographer Daniel Mindel and Episode VIII director Rian Johnson each stated that Abrams would use little computer-generated imagery (CGI) and more practical, traditional special effects in order to recreate the visual realism and authenticity of the original Star Wars film. To that end, the droid BB-8 was a physical prop developed by Disney Research, created by Neal Scanlan and operated live on set with the actors. Seven BB-8 puppets were constructed for filming. The most prominent was a rod puppet, controlled by puppeteers Dave Chapman and Brian Herring. In addition, there were several radio controlled units and some static prop versions. A fully functioning, self-contained robotic unit was not practical for shooting, so most of the "walking" scenes were achieved by the puppet, with rods removed in post production. Later a self standing remote controlled unit was constructed and used at promotional events. The voice of BB-8 was supplied by comedians Bill Hader and Ben Schwartz, both credited as "BB-8 vocal consultants" in the film. The effect was created by Abrams manipulating Hader and Schwartz's voices through a talkbox attached to an iPad running a sound effects app. BB-8 was first seen in the 88-second The Force Awakens teaser trailer released by Lucasfilm on November 28, 2014. Its name was revealed by Entertainment Weekly in a Lucasfilm-designed Topps-style trading card mockup in December 2014. In the film, the robot is the astromech droid of the Resistance X-wing fighter pilot Poe Dameron (Oscar Isaac). Poe entrusts it with a map that must be delivered to the Resistance headquarters in order to determine the whereabouts of Jedi Knight Luke Skywalker. While Poe is captured and interrogated by the sinister First Order commander Kylo Ren, BB-8 flees across the desert of the planet Jakku and finds sanctuary with the plucky scavenger Rey. Eventually Rey, the renegade stormtrooper Finn, Han Solo, and Chewbacca bring BB-8 to Resistance leader Leia Organa, and ultimately reunite him with Poe. In The Last Jedi, BB-8 fixes Poe's X-wing weapons system by smashing his head into it. In Canto Bight, a drunken gambler repeatedly inserts coins into a slot in BB-8, thinking he is a slot machine. The droid later subdues several guards, allowing Finn and Rose to escape imprisonment. BB-8 then uses the coins to subdue a fourth guard. Later, he operates a First Order AT-ST in order to rescue Finn and Rose after they are captured by the First Order. BB-8 will return in Star Wars: The Rise of Skywalker. BB-8 makes several appearances in Star Wars Forces of Destiny. In "Sands of Jakku" and "BB-8 Bandits", both of which take place shortly after Rey finds him in The Force Awakens, Rey helps the droid evade a Nightwatcher worm and several bandits. In "Tracker Trouble", the droid, Rey, Finn, and Han help to get a tracker off the Millenium Falcon shortly after leaving Jakku. In "Shuttle Shock", which takes place during the journey to Canto Bight in The Last Jedi, BB-8 is overloaded by electrical shocks from a jellyfish monster, forcing Finn and Rose to try and fix it. BB-8 is a supporting character in the 2018 animated TV series Star Wars Resistance. BB-8 is a point of view character in both the 2015 novelization of The Force Awakens by Alan Dean Foster, and the 2017 novelization of The Last Jedi by Jason Fry. The droid also appears in the comic book series Star Wars: Poe Dameron, published by Marvel Comics in April 2016. The official September 4, 2015 launch of all merchandise for The Force Awakens included an 11.4-centimeter-tall (4.5-inch) mobile app-enabled BB-8 robot toy developed by Sphero. Sphero had participated in a Disney-run startup accelerator program in July 2014, during which Disney CEO Bob Iger showed Sphero executives on-set photos and imagery of BB-8 before anyone outside of the production team knew of the robot's existence. Sphero acquired the license in November 2014, completing the development and production of the toy in time for its September 2015 release. Wired called the BB-8 toy "the only truly cutting-edge item" in the Force Awakens collection. In 2015, Sphero sold over 1 million of the robots. Other BB-8 merchandising includes household items, luggage and bags, a life-size plush, a Lego Star Wars playset called Poe's X-wing Fighter, Hasbro's Star Wars: The Force Awakens Takodana Encounter set, and other action figures and other toys. The Lego versions of Poe and BB-8 have also appeared in the 2016 short form animated series Lego Star Wars: The Resistance Rises, and the short Poe Dameron vs the First Order Snowspeeder. We haven't even seen Star Wars: The Force Awakens but we (as in: humanity) don't need to in order to know that BB-8 is the break-out star. This soccer ball that thinks it is a robot is a masterpiece of evocative design that instantly evokes a galaxy far, far away. You see BB-8, even if only in silhouette, and you immediately think Star Wars. Rey and Finn and Poe’s little pal is a hint of the continuing universe that will unfold with The Force Awakens, and a promise to fans that the filmmakers of the new films have a deep understanding of what makes Star Wars fun and mythic. Abrams and his team of designers and technicians introduce a new star ... A roly-poly cueball with a surprisingly expressive half-dome for a head—and a vocabulary of squeaks and squiggles that are more eloquent than mere words—BB-8 is both modernist and old-fashioned at once, a marvelous creation that could have sprung from the imagination of Jules Verne. 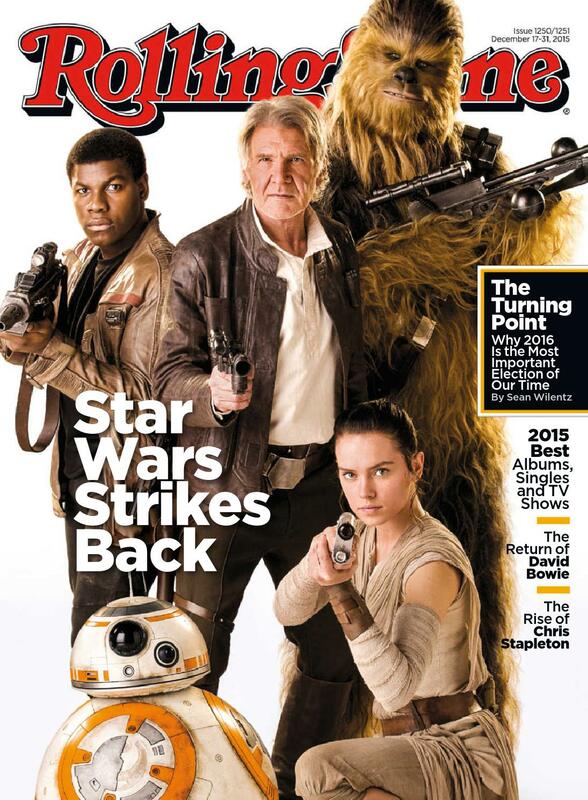 BB-8 appeared with several other Force Awakens characters on the December 2015 cover of Rolling Stone, and alone on the cover of the December 18, 2015 issue of The Hollywood Reporter. The droid was also featured alone on one of two alternate covers of the December 14, 2015 issue of Time (the other cover featuring R2-D2). This was the first time the magazine has offered two covers for editions worldwide. The Time cover photographer, Marco Grob, said, "The moment you meet BB-8, you almost build some form of weird human connection. It has this really cute way of looking at you." The Force Awakens received seven Visual Effects Society Award nominations, including one for Outstanding Models in a Photoreal or Animated Project for BB-8. ^ a b c Brooks, Dan (August 26, 2015). "Droid Dreams: How Neal canlan and the Star Wars: The Force Awakens Team Brought BB-8 to Life". StarWars.com. Retrieved December 18, 2015. ^ a b Szostak, Phil (2015). The Art of 'Star Wars: The Force Awakens'. Abrams Books. p. 110. ISBN 978-1-4197-1780-2. ^ a b c d e f Breznican, Anthony (November 13, 2015). "BB-8: Creating the roly-poly droid from Star Wars: The Force Awakens". Entertainment Weekly. Retrieved December 4, 2015. ^ a b Breznican, Anthony (August 12, 2015). "Star Wars: The Force Awakens: J.J. Abrams explains what's in a name". Entertainment Weekly. Retrieved December 6, 2015. ^ Taylor, Chris (August 22, 2013). "Star Wars Episode VII to Use Film, Be More Like Original Trilogy". Mashable. Retrieved September 7, 2013. ^ McMillan, Graeme (August 18, 2014). "Rian Johnson Says Next Star Wars Will Have Less CGI, More Practical Effects". The Hollywood Reporter. Retrieved August 18, 2014. ^ Otero, Jose (April 16, 2015). "Star Wars Celebration: Why Star Wars 7 uses practical effects". IGN. Retrieved April 21, 2015. ^ a b Hackett, Robert (May 26, 2015). "Disney just developed the most adorable walking robot". Fortune. Retrieved July 23, 2015. ^ Couto, Anthony (December 13, 2014). "Mark Hamill Says Star Wars: The Force Awakens' BB-8 Is a Prop, Not CGI". IGN. Retrieved April 21, 2015. ^ Fischer, Russ (April 16, 2015). "Watch Awesome The Force Awakens Droid BB-8 Appear Live on Stage". /Film. Retrieved April 21, 2015. ^ Russon, Mary-Ann (April 17, 2015). "Star Wars: The Force Awakens – The BB8 robot droid is a real machine, not a puppet or CGI". International Business Times. Retrieved December 4, 2015. ^ Lee, Josh; Denton, Matt (April 10, 2017). Puppetry of BB-8. The Hobble & Stitch Show. Event occurs at 6:54. Retrieved April 13, 2017. ^ McWeeny, Drew (December 15, 2015). "Wait a minute... who played the voice of BB-8 in Star Wars: The Force Awakens?". HitFix. Retrieved December 16, 2015. ^ Lewis, Andy (December 1, 2014). "Trailer Report: Star Wars Teaser Beats Age of Ultron In Debut". The Hollywood Reporter. Retrieved December 2, 2014. ^ Breznican, Anthony (December 11, 2014). "Star Wars: The Force Awakens character names revealed (in coolest way possible)". Entertainment Weekly. Retrieved December 11, 2014. ^ "Star Wars: The Force Awakens Digital Trading Cards". StarWars.com. Retrieved December 6, 2015. ^ Taylor, Chris (July 3, 2017). "Watch Rey and BB-8's first thrilling adventure in Star Wars: Forces of Destiny". Mashable. Retrieved July 5, 2017. ^ Brockington, Ariana (April 26, 2018). "Disney Channel Orders Star Wars Resistance Animated Series". Variety. Retrieved May 10, 2018. ^ Foster, Alan Dean (2015). "Chapter I". The Force Awakens (e-book). ISBN 9781101965504. ^ Truitt, Brian (January 17, 2016). "Exclusive: Star Wars: Poe Dameron comic book debuts in April". USA Today. Retrieved February 15, 2016. ^ "Star Wars: The Force Awakens Products Coming on September 4". ComingSoon.net. May 3, 2015. Retrieved May 3, 2015. ^ McNary, Dave (August 26, 2015). "Disney Sets Massive Star Wars Toy Promotion". Variety. Retrieved August 27, 2015. ^ McMillan, Graeme (August 26, 2015). "Star Wars: The Force Awakens Toys to Be Unveiled During 18-Hour YouTube Marathon". The Hollywood Reporter. Retrieved August 27, 2015. ^ a b McFarland, K. M. (September 3, 2015). "The Story (And Tech) Behind That Awesome Star Wars BB-8 Toy". Wired. Retrieved September 5, 2015. ^ Nakashima, Ryan (August 15, 2015). "Disney's support for start-ups led to one new company winning a dream Star Wars contract". The National. Abu Dhabi. Retrieved September 5, 2015. ^ a b Fitzpatrick, Alex (September 3, 2015). "This Will Be the Star Wars Toy Every Kid Wants This Holiday". Time. Retrieved December 6, 2015. ^ Miller, Ross (September 3, 2015). "You can now buy Star Wars adorable BB-8 droid and let it patrol your home". The Verge. Retrieved December 6, 2015. ^ "How Sphero Created Their BB-8 Toy". StarWars.com. September 10, 2015. Retrieved December 6, 2015. ^ Lewin, Sarah (November 4, 2015). "Makers of Star Wars BB-8 Droid Toy Promise Hidden Tricks". Space.com. Retrieved December 6, 2015. ^ Burton, Bonnie (September 4, 2015). "Force Friday furnishings: New Star Wars decor from ThinkGeek". CNET. Retrieved December 4, 2015. ^ Walsh, Michael (December 3, 2015). "Journey Through the Galaxy with BB-8 Luggage". Nerdist.com. Retrieved December 5, 2015. ^ a b "First Look at Star Wars: The Force Awakens Toys". IGN. September 1, 2015. Retrieved December 6, 2015. ^ a b Kooser, Amanda (September 22, 2015). "Hug this life-size plush BB-8 Star Wars droid". CNET. Retrieved December 4, 2015. ^ "75102-1: Poe's X-wing Fighter". Brickset.com. 2015. Retrieved December 6, 2015. ^ "sw661: BB-8". Brickset.com. 2016. Retrieved January 13, 2016. ^ Cochran, Jay (February 11, 2016). "Star Wars The Force Awakens 3.75" Takodana Encounter Set with Maz Kanata Figure". JediInsider.com. Retrieved July 27, 2016. ^ Breznican, Anthony (February 11, 2016). "Maz Kanata action figure among new Star Wars: The Force Awakens toys". Entertainment Weekly. Retrieved July 27, 2016. ^ Walsh, Michael (September 3, 2015). "Hot Topic Force Friday Boasts Funko POP! Figures and Other Star Wars Goodies". Nerdist.com. Retrieved December 6, 2015. ^ Wong, Raymond (September 19, 2015). "Hasbro's remote-controlled BB-8 is bursting with charm, even when it fails". Mashable. Retrieved December 24, 2015. ^ Li, Shirley (February 12, 2016). "The Force Awakens characters to appear in new LEGO Star Wars series". Entertainment Weekly. Retrieved April 23, 2016. ^ "LEGO Star Wars: The Resistance Rises to Debut on Disney XD February 15". Oh My Disney. February 2016. Retrieved April 22, 2016. ^ Watercutter, Angela (February 12, 2016). "This New Animated Lego Star Wars Short Looks Legit". Wired. Retrieved April 25, 2016. ^ Whitbrook, James (February 12, 2016). "Poe Dameron Stages a Daring Rescue in the First The Force Awakens Lego Short". io9. Retrieved April 25, 2016. ^ "Poe Dameron™ vs the First Order Snowspeeder™". Lego.com. December 17, 2015. Retrieved April 25, 2016. ^ Faraci, Devin (April 16, 2015). "BB-8 Is the Breakout Character of 2015". BirthMoviesDeath.com. Retrieved December 5, 2015. ^ Roeper, Richard (December 15, 2015). "Star Wars: The Force Awakens: The thrills are strong with this one". Chicago Sun-Times. Archived from the original on December 18, 2015. Retrieved December 16, 2015. ^ Stubby the Rocket (December 9, 2015). "The Sci-Fi/Fantasy Characters We Couldn't Stop Talking About in 2015". Tor.com. Retrieved December 10, 2015. ^ Travers, Peter (December 16, 2015). "Star Wars: The Force Awakens". Rolling Stone. Retrieved December 21, 2015. ^ McCarthy, Todd (December 16, 2015). "Star Wars: The Force Awakens: Review". The Hollywood Reporter. Retrieved December 29, 2015. ^ Asher-Perrin, Emily (December 21, 2015). "One Fan's Blow-By-Blow Reaction to Star Wars: The Force Awakens, or, How Episode VII Made Me Sob Continuously in Front of My Friends Forever". Tor.com. Retrieved December 29, 2015. ^ Nashawaty, Chris (December 16, 2015). "Star Wars: The Force Awakens: A 'rollicking adventure wrapped in epic mythology'". Entertainment Weekly. Retrieved January 19, 2016. ^ Hornaday, Ann (December 16, 2015). "Star Wars: The Force Awakens gets the nostalgia-novelty mix just right". The Washington Post. p. T29. Retrieved January 15, 2016. ^ Zacharek, Stephanie (December 15, 2015). "Review: The Force Awakens Is Everything You Could Hope for in a Star Wars Movie—and Less". Time. Retrieved December 16, 2015. ^ "Cover: Star Wars Strikes Back". Rolling Stone (1250/1251). December 2015. Archived from the original on 2015-12-22. Retrieved December 16, 2015. ^ Hiatt, Brian (December 2, 2015). "Star Wars Strikes Back: Behind the Scenes of the Biggest Movie of the Year". Rolling Stone. Retrieved December 16, 2015. ^ Bond, Paul (December 9, 2015). "How Star Wars Will Change Hollywood (Again)". The Hollywood Reporter. Retrieved December 29, 2015. ^ a b c Miskell, Kyle (December 3, 2015). "Star Wars: The Force Awakens: Everybody's Favorite Droids Grace the Cover of Time Magazine". Collider. Retrieved December 16, 2015. ^ Grossman, Lev (December 14, 2015). "How J. J. Abrams Brought Back Star Wars". Time. 186 (24). Retrieved December 16, 2015. (Subscription required (help)). ^ Rothman, Lily (December 3, 2015). "See Every Star Wars Cover in TIME Magazine History". Time. Retrieved December 16, 2015. ^ "Star Wars: The Force Awakens Dominates Visual Effects Society Nominations". IGN. January 12, 2016. Retrieved January 15, 2016. ^ "Visual Effects Society Announces Nominees for the 14th Annual VES Awards". Visual Effects Society. January 12, 2016. Retrieved January 15, 2016.